The machine had once been working well: efficiently, smoothly and quietly. Somewhere there has been a change. It is now less efficient. More energy is needed to get the same amount of work done. There is friction. It now makes noise. The rest of the machine reacts to the change. 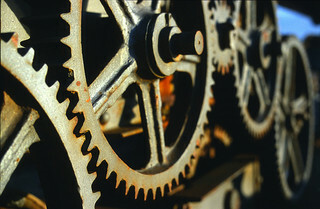 The gears spin, then they engage. Sparks fly. Teeth break. The machine lurches. These are reactions. These are not intentional choices. They are not deliberate decisions. We may try adding more grease to the machine to stop the annoying sounds it makes. At first it smooths things. It may quiet things down for awhile, but the noise will come back. We can keep adding grease to the machine indefinitely. Even so it may still all come to a grinding halt. Greasing the squeaking wheel does not address the underlying change that causes the sound it makes. Or we can make deliberate, intentional choices about how we decide to respond to the change. It may require other changes in response. It may require fundamental readjustments of all the parts. Parts may need to be fixed or replaced. The whole machine may need to be retooled. It may need to be refurbished, rebuilt or even redesigned. Or maybe just a tweak in the position of one gear will get things running smoothly again. Conflict is a sound that change makes. Conflict resolution is the process of making deliberate decisions and intentional choices about how we respond to change. This entry was posted on Tuesday, September 18th, 2012 at 9:29 am and is filed under Conflict, Conflict Resolution, Dispute Resolution. You can follow any responses to this entry through the RSS 2.0 feed. You can leave a response, or trackback from your own site.